If you’re reading this it’s most likely because you’re a busy mom. And let’s face it, if you’re a mom, you’re busy. You might also be feeling just a little bit overwhelmed or unsure of yourself. In today’s world of information overload and pintrest perfect pictures it’s hard not to feel overwhelmed and unsure. But here’s the deal, most of those pictures are staged and real life isn’t. Real life is messy and wonderful and crazy and, at times, overwhelming. It’s so easy to get caught up in the idea that there’s one perfect way of doing things and if you can only discover that one way, life will be perfect. While these books are written from the perspective of a busy mom, I really believe that the principles that are shared will also be helpful to others in different life circumstances. I’ve intentionally kept the ebooks relatively short, simple and to the point because busy mom’s don’t usually have time to read long drawn out books. If you are regularly overwhelmed and frustrated with laundry, then let me assure you there’s hope. Maybe your family has changed and your system needs to change with it. Or maybe you are looking at too many online photos of magazine quality laundry rooms and you have a skewed sense of what “laundry” is all about. Whatever the reason for your frustration, this book will help you think through your schedule and systems and develop a plan that is unique for your unique family. 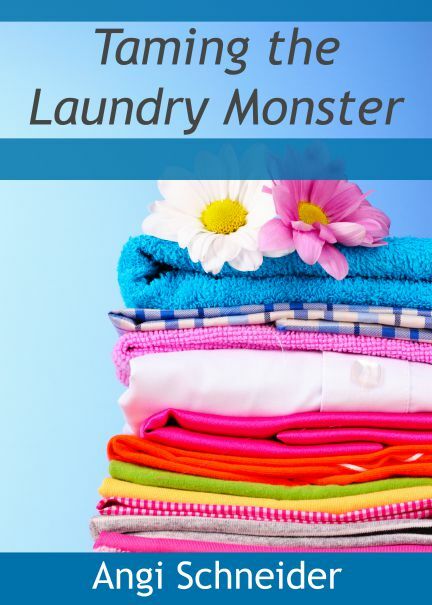 Although this book is written from a Mom’s perspective, it will help anyone who has a laundry monster.